The Digiscoping Technique started around 1999, when Laurence Poh considered the “Father of Digiscoping“, began to attach digital still cameras into the eyepiece of different spotting scopes. Very soon he discovered that incredible results could be obtained with the magnification of the scopes as mega-telephoto-lenses. We would not consider Digiscoping for serious wildlife photography. Digiscoping is something that we bird guides and birders do in order to record birds or those special moments when we do birding; anyway for those who would like to get better image results of those special moments these are some very basic suggestions. The pros are: Much less expensive than buying an SLR system with big expensive lenses; in Digiscoping you have tons of focal length and you can use the scope for Birdwatching too. The Cons: Slow shutter speeds; it is more difficult to find the subject, and if you want to get serious in digiscoping you need some customized accessories. There are two ways of doing digiscoping; handholding the camera into the eyepiece or via an adapter. Achieving a sharp image using the digiscoping method is not an easy matter; there are many factors to be considered. Light: Is one of the most important factors when digiscoping. In Panama our dry season goes from mid December to mid April; I would say that those are the best months of the year for Digiscoping in Panama. During the rainy season we have a lot of sunny mornings, but it would be harder to get a sunny afternoon. Scope: Get a good scope: HD or ED glass, not less than 77mm in diameter. That will give you more light, especially in the forest interior. Tripod: Bogen Manfrotto with a Micro-fluid head. Camera: Not all the cameras work with Digiscoping; in general 3x to 3.5 optical zoom digital cameras are the best ones. In later years new smart phones work pretty good too. 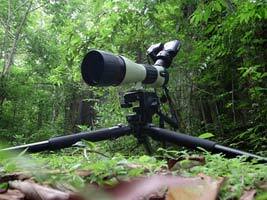 Eyepieces: They are vital in Digiscoping, 12x to 20x fixed eyepieces or 20x to 30x zoom eyepieces. Higher than 30x magnifications will reduce the shutter speed of your camera, and in Digiscoping we are trying to achieve faster shutter speeds. Wide angle eyepieces are the ones used, that will give less vignetting, the dark circle area around the photo. Adapter: (If necessary) to place the closer you can the lenses of the camera to the eyepiece, and get less vignetting. If you have steady hands you can try handholding the camera into the eyepiece. Remote cable release: (If necessary) to obtain sharp pics. Photoshop: Is a must. Basic Photoshop is necessary to fix the pics. All these elements plus you as a photographer should work together, so the final product can look net on the web. It takes practice and patience; most of all respect the birds and their environment, don’t get close to nesting areas and avoid the extra use of birdcalls. 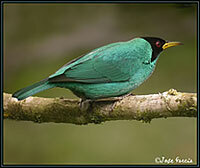 These Digibird Photos were taken in different locations of Panama using the Digiscoping method. All of them are Wild Birds. Cameras: Iphone6 and Canon S95. Eyepieces: 12x digi-eyepiece & Nikon 30x Wide DS. 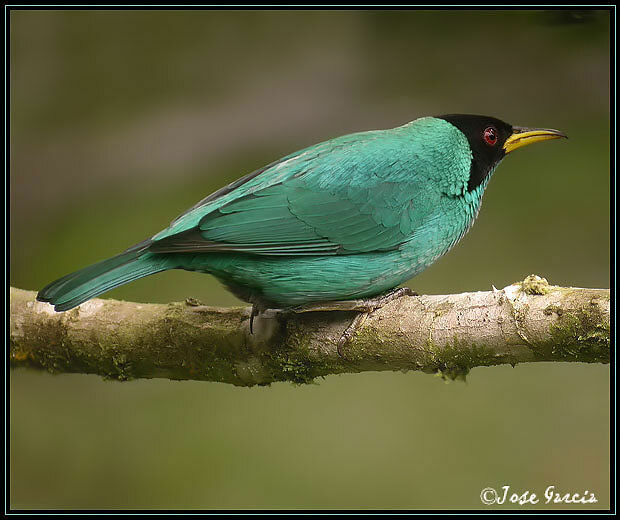 We organize Panama digiscoping tours at extra slow pace, in a variety of habitats; then after this, we review the photos in Photoshop and make the corrections. "Thanks for the special days in the Darien! Our compliments for your organization, especially for Mae, you are an excellent and charming host!."